For the 24 hours to 23:00 GMT, the AUD rose 0.67% against the USD and closed at 0.7172 on Friday. LME Copper prices rose 0.9% or $57.5/MT to $6490.0/MT. Aluminium prices declined 0.2% or $4.0/MT to $1843.5/MT. In the Asian session, at GMT0300, the pair is trading at 0.7178, with the AUD trading 0.08% higher against the USD from Friday’s close. 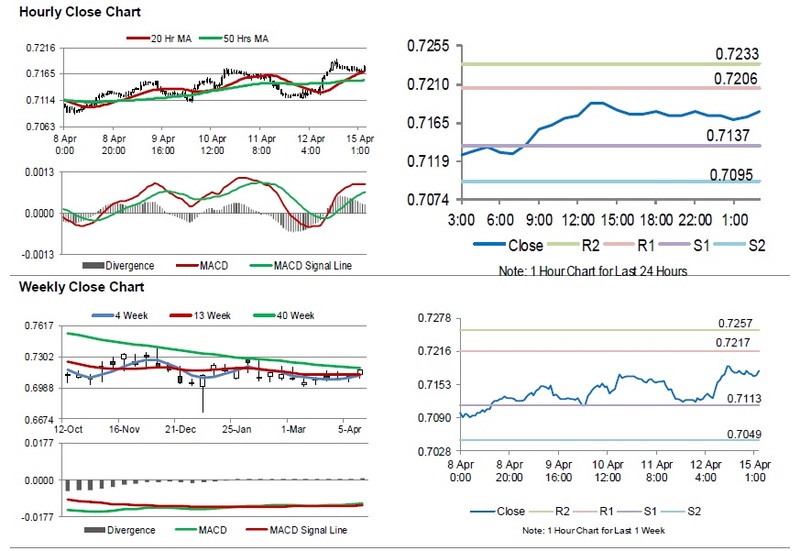 The pair is expected to find support at 0.7137, and a fall through could take it to the next support level of 0.7095. The pair is expected to find its first resistance at 0.7206, and a rise through could take it to the next resistance level of 0.7233. In absence of key economic releases in Australia today, investor sentiment would be determined by global macroeconomic events.